The third major group that was culled from the original Psilophytales by Banks is the Trimerophytophyta. Trimerophytes1 were generally more complex than either the rhyniophytes (from which they are thought to have descended) or the zosterophyllophytes. 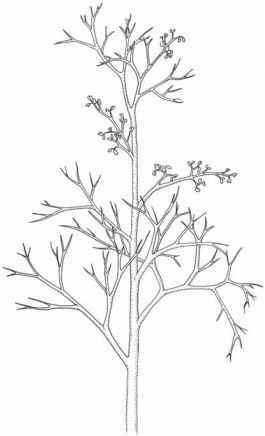 Trimerophytes demonstrate monopodial branching of the main axes, with lateral axes showing either dichotomous or trifurcate branching. As with rhyniophytes, the sporangia are terminal, although typically they are fusiform to elongate and aggregated or clustered on fertile branches. Internally, the members of this group also exhibit greater complexity, in the form of a relatively large (compared to stem diameter), centrarch stele. Tracheid wall patterns vary from scalariform-bordered to circular-bordered pitting. Trimerophytes are considered to have given rise to all the other vascular plants, with the exception of the lycopsids. 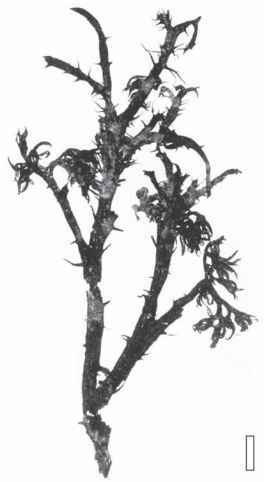 As indicated in the preceding section, Psilophyton specimens with lateral sporangia were transferred to the zostero-phyllophyte genus Sawdonia. The remaining Psilophyton specimens, that is, those with terminal sporangia, are retained in the Trimerophytophyta. 1Based on the scientific name of this group, the common name should probably be the trimerophytophytes. However, for the sake of simplicity, we have chosen to use trimerophytes. (in two opposite, vertical rows) along the main axes. Vegetative branches are naked and dichotomize at right angles, terminating in slender, blunt tips. Fertile branches typically branch up to six times before terminating in clusters of ~32 sporangia. Individual sporangia are <5.0mm long, with dehiscence occurring along the lateral surface. The trilete spores vary from 40 to 75 pm in diameter with a smooth spore wall, although in some specimens, a thin layer often appears separated from the spore body. Fine structural details of the spores have been provided by Edwards et al. (1996). If found as dispersed grains, such spores would most closely approximate the sporae dispersae taxa Retusotriletes or Phyllothecotriletes. The conducting tissue of P. dawsonii consists of a centra-rch protostele that accounts for approximately one-quarter of the stem diameter. In more basal regions of the plant, the strand has several enlarged protoxylem zones and numerous, radially aligned conducting elements of the P-type (Kenrick and Crane, 1997a). They have bordered pits with secondary wall material that extends across the pit apertures (Hartman and Banks, 1980). Traces supplying the fertile branches are initially terete, becoming more rectangular in outline at higher levels. Surrounding the central strand is a multilay-ered cortex consisting of collenchymalike cells and, toward the periphery, substomatal chambers. In P. princeps, the stem surfaces are ornamented by a number of cup-tipped spines. The larger size of the sporangia and the nature of the vegetative branching further distinguish this species from P. dawsonii. The conducting strand of P. princeps consists of a solid strand of elements that is either mesarch or centrarch. Psilophyton crenulatum (FIG. 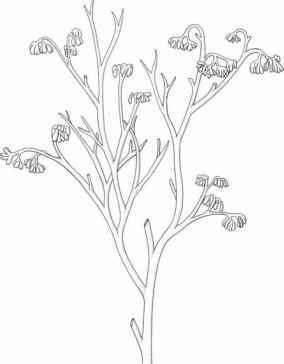 8.81) a species from the Lower-Middle Devonian of New Brunswick, Canada, has spiny branches that dichotomize several times and terminate in slender, recurved tips. On the surface of the axes are multicellular spines up to 6.0 mm long; some have forked tips, whereas others are trifurcate. The vascular strand is described as centrarch and constructed of elements with scalariform-circular bordered pits. The fertile units (clusters of sporangia) in P. crenulatum (FIG. 8.81) (Doran, 1980) are alternate and distichous, or may be helically arranged. In the distal regions they are covered by semicircular crenulations. The fusiform sporangia are up to 5.0 mm long and twisted; spores range from 48 to 102 pm in diameter and conform to the genus Apiculiretusispora. Short recurved lateral branches and elongate pairs of sporangia that are of unequal length are characteristic of Aarabia, an early Emsian (Early Devonian) plant from Morocco (Meyer-Berthaud and Gerrienne, 2001). pseudomonopodial and the naked stems were marked by longitudinal striations. Ellipsoidal sporangia were produced in pairs on fertile lateral branches and spores ranged 53-96 pm in diameter. In P. dapsile (FIG. 8.83) (Kasper et al., 1974), known from the Middle Devonian of Maine, the axes measure ~2.0 mm in width and the erect plant is thought to have been about 30.0 cm tall. The stems are smooth and branched dichot-omously. Sporangia are small (2.0 mm long) and borne in dense clusters at the ends of closely spaced, distal dichotomies. One species of Psilophyton , P. hedei, which was described from Silurian rocks of Sweden, is now thought to represent some type of invertebrate similar to a graptolite or a ptero-branch. In this instance, the branched axis may represent a colony of numerous individuals that share a system of internal tubes and the characteristic stem spines probably represent free zooidal tubes (Lundblad, 1972). Pertica quadrifaria (FIG. 8.84) is another Devonian plant that can be assigned to the trimerophytes on the basis of its branching pattern and the nature of its fertile region (Kasper and Andrews, 1972). The genus is known from compression remains and has been described from at least two localities of Early Devonian age. The size of some specimens suggests that the plant may have exceeded 1.0 m in height. Numerous, dichotomously branched laterals are borne on the main axis in a tetrastichous pattern (i.e., in four rows). The distal ends repeatedly dichotomize at right angles to each other. Like all trimerophytes, the lateral branches were either completely sterile or completely fertile. The fertile ones consist of closely spaced dichotomies that terminate in masses of sporangia borne on short stalks. Sporangia are elliptical in outline and lack any histologic evidence of a dehiscence mechanism. Poorly preserved spores that are about 64 pm in diameter suggest that P. quadrifaria was homosporous. branches of P. varia are arranged in subopposite pairs (with the successive laterals decussate. Paired sporangia are erect, but the number of sporangia per cluster is smaller than in P. quadrifaria. Spores of P. varia are subcircular-subtrian-gular and <90 pm in diameter. In P. dalhousii the lateral branches are spirally arranged and divided pseudomonopodi-ally (Doran et al., 1978). Trimerophyton robustius, the type species of the group, was initially described by Dawson (1859) as Psilophyton robus-tius from some fragmentary specimens collected from the shore of Gaspe Bay. The generic name Trimerophyton was introduced many years later on the basis of a single specimen, also from the Gaspe (Hopping, 1956). The main stem of T. robustius is ~ 1.0 cm wide and consists of numerous helically arranged, trifurcate, lateral branches. The primary and secondary branching patterns of the laterals are trichotomous, with further subdivisions of the dichotomous type. All axes are smooth, with the exception of some that are longitudinally striated. Ultimate branches bear erect sporangia in clusters of three (FIG. 8.85). It has been suggested that Trimerophyton may represent the distal parts of Pertica (Gensel and Andrews, 1984).